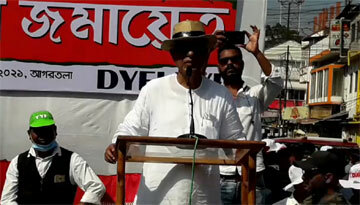 Opposition leader and the former chief minister Manik Sarkar on Wednesday accused the ruling Bharatiya Janata Party and alleged that the party which has come to power by hatching several conspiracies in the state is now scared of the people of this state who are losing trust on the BJP. Manik Sarkar while addressing a press conference on Wednesday evening said that the BJP has come up putting a huge difference between the promises made to the state and their ongoing activities. Manik Sarkar also alleged that targeting the upcoming by-elections to the three tier panchayat election, the BJP is trying to suppress the people of this state and the opposition parties from participating in the election and open up with the conspiracies of the BJP. Meantime, Manik Sarkar, the opposition leader on Wednesday alleging of deteriorating law and order situation in the state has appealed the BJP government to return peace among the people of this state and get back the law normalise. Manik Sarkar in his statement today also sought the intervention of state election commission over conducting free and fair election to three tier panchayats scheduled to be held on September 30.